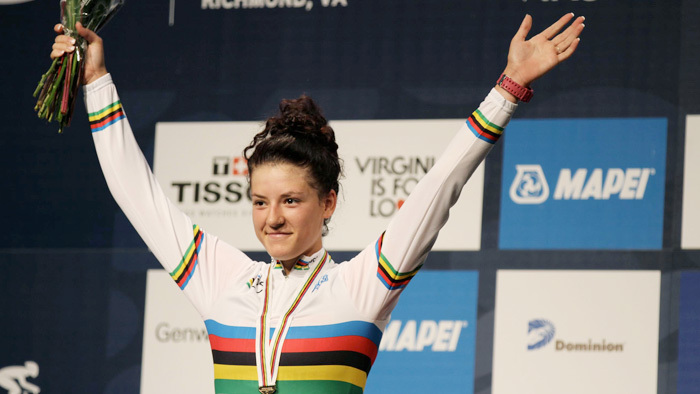 Chloe Dygert took home the World Champion title in the junior women’s road race in solo fashion. The 18-year-old American was part of a four woman breakaway, then she got a gap at the end of lap 3 and never looked back. View the power she put down in order to claim the title. View Dygert’s full Quarq power file. Dygert set her Peak One Minute Power the first time up the 23rd Street climb. She averaged 473 watts, or 7.19w/kg. Her Peak 20 Minute Power was set during the end of lap 3 heading into lap 4 where she averaged 279 watts and 22.9mph. Dygert rode very consistent laps. Her last lap was the strongest, with a 294 watt Normalized Power® average. Over the 40 mile course, Dygert averaged 233 watts, 23.5mph, 84rpm, and burned 1441 calories.